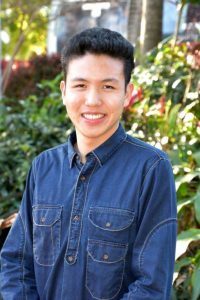 My name is Benjamin Lau, I’m 17 this year and I’m a grade 12 student from Nambour Christian College on the Sunshine Coast. I play cornet, soprano cornet, but the instrument I mainly specialise is trumpet and I’ve been playing it since I was 11. I’ll also be taking my grade 8 AMEB exam for that instrument at the end of this year. Other instruments I been previously taught include drums, piano and singing (all one year each), but I now self-teach singing. I’m a self-taught composer, I don’t have a proper composition mentor/teacher. I only check my compositions with a teacher if it’s an assessment piece for music class at school. I first got into composing when I discovered the Sibelius software in my grade 7 music class. As I played around with the notation software it gradually became a hobby in turn became a passion. Serious composing began last year when I entered this competition for the first time and I’ve also entered the ACMF songwriting competition last year being shortlisted for the instrumental section. I also created a YouTube channel in January called AnotherkindofVibrato uploading compositions and arrangements for fun. I found out about Artology through one of my music teachers at school Mrs Donaldson last year and received a highly commended that year. I played the roles of Pharaoh and Simeon in this year’s school production of Joseph and the Amazing Technicolor Dreamcoat, performed in the school’s wind symphony, stage band, brass ensemble, choir and worship team. 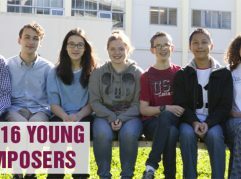 Outside of school, I am also a former member of the Sunshine Coast Youth Band playing cornet first then moving to soprano cornet and late last year joined the Calvary Youth (SC) Creative Team as a singer. 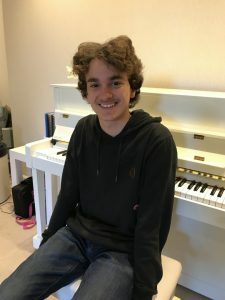 I taught myself to compose by making use of my perfect pitch ability which I discovered at about the age of 12, listening to a variety of concert band, jazz band and brass band music and looking their scores to get a thorough understanding of the expressions, techniques written on the sheet music. Sometimes I will even listen to orchestral and video game music to develop ideas and bring their influence into my compositions. Live recording from the studio day. First time entering the competition last year, I didn’t put a lot of effort into writing the piece. I only found out about the competition a few weeks before the submission deadline. This year, I wanted to write something personal, a piece that actually means something to me. Last year, I had quite a rough time, receiving disappointment after disappointment: with grades not up to standard, not winning anything from the competitions I entered, not receiving an award on the school’s speech night, I just felt like a complete failure. 2017 was definitely not my year and I was generally not happy with myself. But near the end of the year before I got baptised, I had a feeling that 2018 was going to be different. This year I was going to redeem myself which was where I got the name “Redemption” from. I made sure that this year I wouldn’t lose again and decided to push myself even harder. So I listened to as many pieces as possible and looked at all the scores I could find on those pieces and analyse them in order to write my fanfare. I only listened to pieces I regularly listen to which are from either brass band, concert band, jazz band, bit of video game and orchestral music but no fanfares. I didn’t even look at the resources page in the Artology website. I did however listen to last year’s fanfares to get a sense of the kind of piece the panel’s looking for. 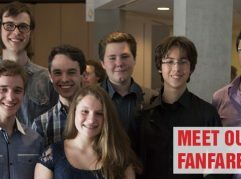 Major influences in the fanfare come from pieces such as Harrison’s Dream by Peter Graham, On the Shoulders of Giants by Peter Graham, Divertimento by Oliver Waespi, Destination Moon by Paul Raphael, Funk Attack by Otto M. Schwarz and one of my own pieces, Anthony’s Ambitions (wind band version), and these are all from concert band or brass band music. There’s also video game influence where I’ve taken various ideas from the music in the video games I’ve played. Generally though, there’s not one specific piece that inspired this fanfare. It is basically a mixture of ideas from pieces I’ve listened to before. My name is Aurora Lahur. I’m 14 years old and I am currently in Year 9 at Sacred Heart Girls’ College Oakleigh. I’ve been playing piano since 2009, when I was five years old, at Yamaha Musical School. During my time there, I learnt how to improvise on a given motif on the spot, and compose my own pieces. In 2012, I started piano and composition lessons with my current teacher, Keiko Fuji. With her help, I composed many pieces and entered them into various competitions. In 2015, I won 1st place for the ACMF songwriting competition. I have also been the recipient of the Tony Dorembus Memorial Award in the Boroondara Eisteddfod in 2014 and 2018. From the age of 12, I started playing cello, and joined a number of ensembles at school. I am currently preparing for my AMusA piano exam. So far, I have composed more than seven pieces, most of which are for piano solo, but I have also composed for piano duet and most recently, this fanfare. My fanfare is called ‘Jubilance’, which refers to the feeling of being exultant, triumphant, and joyous. I named it this because I wanted to make my fanfare sound as if it were announcing the entrance of something important, or as an acclamation of victory. This idea is expressed at the beginning of the fanfare, when the trumpet first plays the motif, followed by the French horn and then the trombone, overlapping. This ‘announcement’ repeats itself several times throughout the A section. This section is primarily in F major, with modulations to E flat major and D major. The middle section is slightly quieter, but then shortly afterwards, it modulates to A flat major and you can hear a very distinct melody played by the brass, accompanied by a series of short, sharp chords played by the string section. The accompaniment does not follow the typical chord progression to create a feeling of tension that will be resolved at the end, where, after a drum roll, all the instruments come together to play the final chord of A flat major, to create a sense of finality and jubilance. During the writing process, I was inspired by fanfares such as Olympic Fanfare and Star Wars by John Williams, 20th Century Fox Fanfare by Alfred Newman, Fanfare for the Third Planet by Richard Saucedo, and Marvel’s Fanfare by Michael Giacchino. 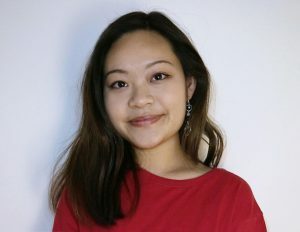 Born in Sydney, Sheree Kuan is an 18-year-old composer and cellist undertaking a Combined Bachelor of Laws and Arts (Music Major) degree at the University of Sydney. She recently graduated from MLC School on a Full Music Scholarship (2012-2017), where she first established the foundations of her love of music during her early years with Karen Carey’s department. Sheree also performs extensively as a solo and orchestral musician, proceeding her position of Principal Cellist in the MLC Symphony and Chamber Orchestras with Principal Cellist of the Sydney University Symphony Orchestra (SUSO). However, her initial passion for music began at a much younger age, when she started the piano at 4 years old and the cello at 6 years old, completing her AMEB Grade 8 for both instruments with High Distinction at the age of 11. Under the tutelage of Susan Blake, she intends to complete her Cello LMusA in early 2019. Compositionally, Sheree was tutored by Tristan Coelho during the completion of her International Baccalaureate Diploma, and 2017 saw her give two solo performances at the Sydney Opera House, as well as performing her original composition for cello duo Birds of Paradise at the Sydney Town Hall. By definition, an impulse is a sudden and unreflective prompt to action. Like a fanfare, it captures and shifts your attention toward what is to happen next. Quite aptly, the idea behind Impulse is that of momentum, driven by the irregular 7/8 metre, sudden changes in dynamic, and a rapidly shifting dialogue between different instrumental sections. Inspired by the original bell cue of the Sydney Opera House, the motif of an oscillating major third is extended and woven throughout the piece. At times, the orchestral texture is stripped back to then build again and maintain a persistent sense of anticipation. Given my background as a performer, I have always been fascinated with exploring the technical limitations and expressive potential of instruments through my compositions. As such, I have implemented techniques such as snap pizz and trills into Impulse to add a more colourful and flamboyant edge. On another note, the title of this piece bears a secondary meaning, being that my personal impetus to compose has always been somewhat impulsive. My incentive to compose comes in sudden bursts and often at odd times, where the skeleton of Impulse essentially came together in one night whilst mid-procrastination. Since I can remember, I’ve always had a liking for music. At around 7 I followed my sister into piano lessons, later finding that percussion was my thing. Playing percussion, I again followed my bass playing sister into QYO; first Wind Ensemble, then QYO2 and now QYS. I’ve learned so much playing in these orchestras. I’ve always been interested in storytelling. My sister and I would muck around with composition and torture our parents with presentations of our creations. A story told through music allows the listener to feel more engaged, rather than having to imagine it after reading a passage from, say, a book. My interest in composition has continued to grow above all else. I hope to study music at University. Achieving in the Artology Competition is an exciting opportunity to learn from Mentor composers and to share with other student composers. Having one of my compositions played by AYO and recorded is brilliant. Cloud Proclamation’ was written as a piece “having something to say” for Artology. The piece opens with low C trumpets to introduce and establish a broad sound which, due to the name of the piece, gives the listener a general sense of full clouds forming on a bright sunny day. The entry of the ‘Cirrus’ clouds is marked by a variety of instruments to provide depth and illustrate fullness. Following immediately, the demi-semi-quaver rhythm enters again on low brass, strings and woodwind and is then responded to by an overlapping whoosh of the higher range instruments (violins, clarinet and flute), as though in conversation. A semi-quaver pattern played here fills in this space, but more importantly, imitates the general unstable feeling of the clouds. With one last rumbling retaliation from the horns, the storm cloud is pushed out by the ‘Cirrus cloud’ and the piece ends. 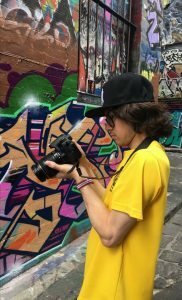 My name is Timothy O’Malley and I am currently in year 12 at St Kevin’s college in Melbourne. In terms of music, I have had an interest from a young age. I learnt violin briefly when I was 5 but it didn’t last because of my refusal to practice, but started learning piano when I was 6 and was more motivated to work hard. In year 5 I took up the trumpet as a secondary instrument after being inspired by the head of music at my primary school, a great jazz trumpeter. Currently for piano I am studying for my Amus and for VCE music performance, and for trumpet I completed my AMEB grade 6 exam 2 years ago, also having kept up playing it in multiple ensembles at school. Outside of school I play cornet in my local A grade Brass band, Boroondara brass, having competed in 2 national championships. I took a particularly keen interest to composition about 3 years ago after finding Khatia Buniatishvili’s phenomenal piano solo recordings of Mussorgsky’s Pictures at an Exhibition, upon learning about them I incidentally found and studied the scores of Ravel’s orchestration. Suddenly having found a passion for orchestral music, I bought a subscription to MSO in 2017, and after seeing works like Petrushka and Shostakovich 5, I was motivated into haphazardly composing many finished (and many unfinished) works. Having had one shorter fanfare, and one longer work played by my school symphony orchestra. 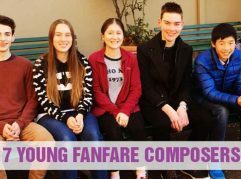 My fanfare, Tuning in A, came as an idea to me when I was attending an ACO concert at Hamer hall and I heard one of the 2017 fanfares played over the speakers. I gained a better appreciation that the real requirement was to find a way of signalling to patrons that a performance was about to start, therefore I decided to base my fanfare around the idea of the tuning of an orchestra, something that creates an idea of anticipation and expectation for the start of a concert. The sustained oboe tuning A is then blended with a trumpet that begins the true fanfare call, a causeway into a more traditional fanfare. Some composers and works that have inspired the style that I took, or have influenced my writing include Mahler’s brass fanfare at the beginning of the last movement of Symphony number 7, Bruckner’s, symphony’s 6 and 7 and how they play with the ‘Bruckner rhythm’ of duple against triple. As well as Stravinsky’s treatment of brass, and my own knowledge of playing the trumpet. Both scores and compositions written by award-winning, Maddie (Ivy) Hughes, help to create a story. 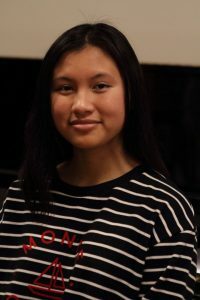 Being a pianist and percussionist from a very early age, her understanding of musical characterisation, interest and ability to write in a wide variety of musical backgrounds generate inspiration for the music she develops. She also had the opportunity to have a Fanfare performed and recorded for Perth Festival. Maddie enjoys to write for orchestral ensembles, jazz-based ensembles, musical theatre and experimental based chamber groups but her central passion is film scoring. She has been working with local and emerging filmmakers and looks to pursue this avenue of music composition. She employs quirks from electroacoustic, contemporary, jazz and classical combinations, which are found in her works. 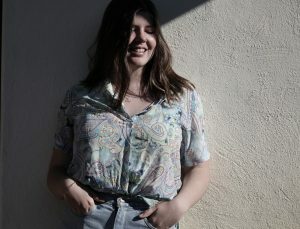 Maddie was the winner of “Best Score” for the Revel8FilmFestival 2017, as well as working alongside the Western Australian Screen Academy with which her scores will be in two short films that are to be televised at the end of this year. Fanfare Awakening! Was inspired by finding myself being outside on a dark stormy afternoon. I remember being caught in the rain with a friend when we were going to see a show and as hilarious as it was, it left us sopping wet and cold. Remembering this I wrote this short piece based on those feelings I experienced. I was just going about my day and then BAM! a storm comes with raging gusts of wind and rain. It certainly caught my attention, so I thought writing the fanfare based on this would produce a similar effect. Loud, demanding and with whirlwinds of flourishes. My name is Ezra Hersch. My passion for music encompasses the piano, clarinet, voice, music theory and composition. I began my music education when I was two-years-old at Australian Music Schools, where I met my first piano teacher, Chiara Pascuzzo, whose infectious enthusiasm continues to inspire my love for piano and music. 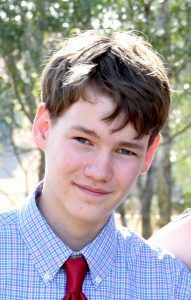 I am now 14 and attend Emanuel School (Sydney) on a music scholarship. I participate in the school stage band, choirs, and recently played Rapunzel’s Prince in the school’s production of Into The Woods. For three years running I participated in the Bondi Wave Music programme, mentored by Lindy Morrison. In this programme we composed original rock songs and performed them at the annual Carols by the Sea concert. I am currently preparing for my Grade 8 examination in piano, my Grade 6 examination in clarinet (with Mark Walton), and my Grade 5 examination in music theory. I also have regular composition and piano lessons with Sally Whitwell, who is an inspiration as a teacher, performer and composer, and whose encouragement has enabled me to continually broaden my musical horizons. 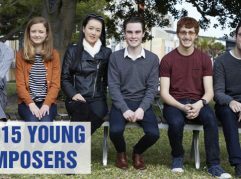 My passion for singing has developed since I was six years old when I joined the Sydney Children’s Choir. SCC has given me an immense appreciation for choral music, and more than anything else has introduced me to the world of Australian choral composition. We have worked with composers such as Dan Walker, Paul Jarman, Paul Stanhope, Elena Kats-Chernin and many others. A few of the highlights for me have been working with the SSO in performances of Berlioz and Mahler at the Sydney Opera House, under the baton of Charles Dutoit and David Robertson. At the time of writing this piece, I was listening to a lot of Mahler (whose symphonies have many fanfare-like moments), and I was definitely inspired by his grand orchestrations creating thick textures. In preparation for writing my fanfare, Beginnings Echo, I reflected on the elements that I thought a fanfare should contain, the most important being its ability to grab people’s attention. It needed to have a “Hey, look at me” quality. For me, the most effective way of achieving this was to create a sense of rhythmic irregularity to create a measure of discomfort in the listeners and to keep their attention. So initially I planned to have changes in time signature (like every Dan Walker piece ever!) from 7/8 to 4/4. But in the end I decided on achieving the same attention grabbing effect by keeping the 7/8-time signature throughout, but changing the quaver grouping between 3,2,2 and 2,2,3. So it all started with a single irregular rhythmic pattern that I repeated throughout the entire piece. Another important element I thought about was that the piece needed a melodic figure that people would remember and hold onto. It is difficult to create this in such a short piece, which is why I chose repetition of an ascending melodic figure (inspired by my love of Philip Glass, who extensively uses repetitive structures). David started learning the violin at the age of 6, and the piano at the age of 7. He demonstrated a keen interest in classical music from an early age, watching and enjoying DVDs of concerts of classics such as Beethoven symphonies. He would later start borrowing scores from the library to peruse while listening. 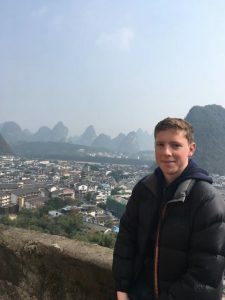 David further developed his passion for music at school, being actively involved in all school-related music ensembles, then giving back by teaching an extra-curricular music class for Year 1s and 2s. David has notably been lead violin for his school’s production of Legally Blonde, and was second chair in the International Schools Choral Music Society Festival Orchestra. He holds a DipABRSM in violin, as well as ABRSM Grade 8 in piano. He began composing independently at the age of 15, at first simply as a hobby. He also greatly enjoys arranging popular music for classical ensembles, and arranging symphonies for smaller chamber ensembles. David currently studies composition at the Sydney Conservatorium of Music, University of Sydney. My piece began life as a little moto perpetuo, and as with many of my pieces I played around with a few ideas and then shelved the piece. I came back to it when considering my entry for this Fanfare competition, realising that it ticked the boxes for many of the elements you expect to hear in a fanfare. There are punctuated brass, a strong sense of rhythm, woodwind flourishes and lots and lots of percussion (within reason!). I tried to write a tonal piece that would appeal to everyone; as such my inspiration for this piece comes from John Adams’ Short Ride in a Fast Machine and Grand Pianola Music. Although the design of the fanfare, starting and stopping, is clearly felt, the underlying impetus that lies continuously throughout never really stops, and I offer that my love of Steve Reich probably influenced that. As for the other music that I compose, I draw inspiration from a multitude of sources, including the music of Alfred Schnittke, Benjamin Britten and Gustav Mahler. I avidly attend concerts of new music to better understand and learn from the experience.